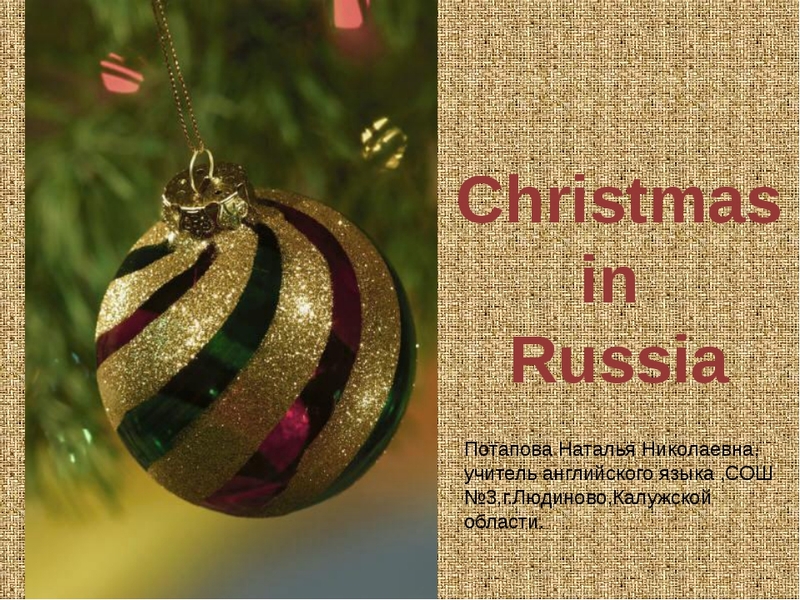 Christmas in Russia Потапова Наталья Николаевна, учитель английского языка ,СОШ №3,г.Людиново,Калужской области. Потапова Наталья Николаевна, учитель английского языка ,СОШ №3,г.Людиново,Калужской области. 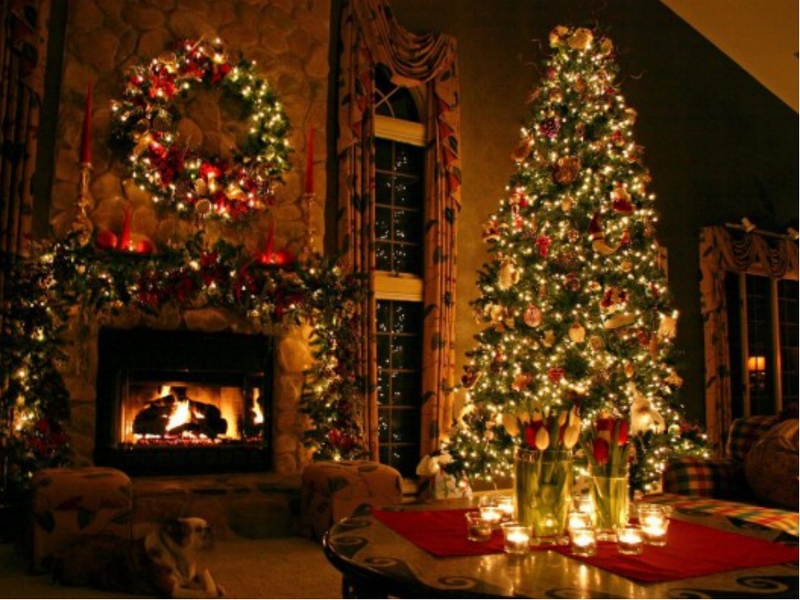 Christmas Christmas is one of the major holidays of Christians, the second after Easter. 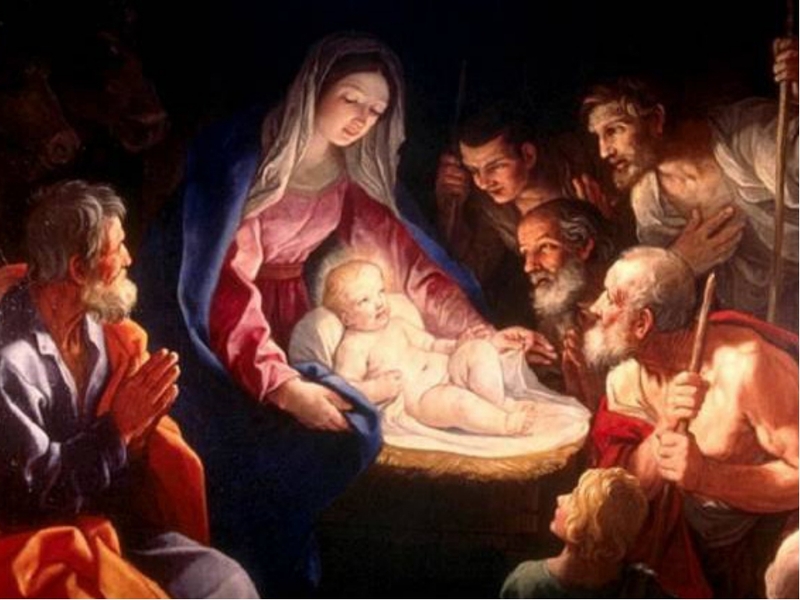 On this day, believers celebrate the most important event - the birth of the Son of God. 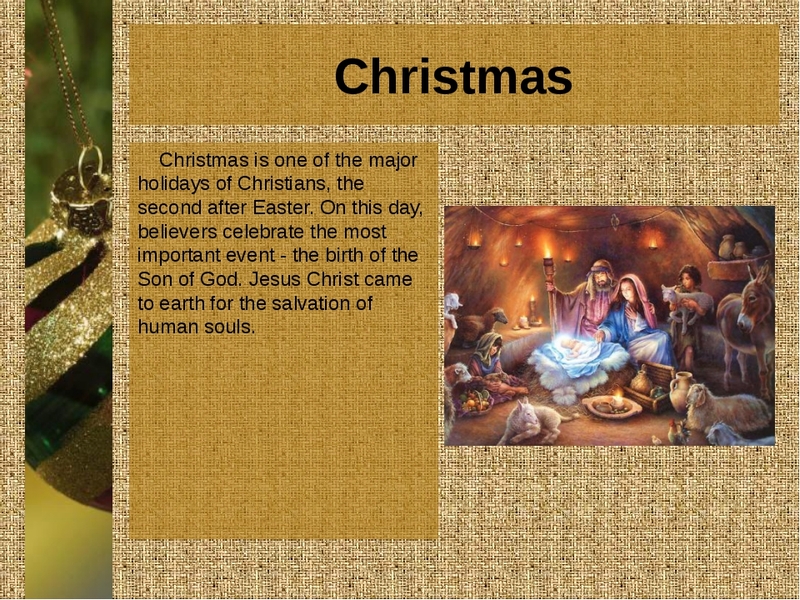 Jesus Christ came to earth for the salvation of human souls. 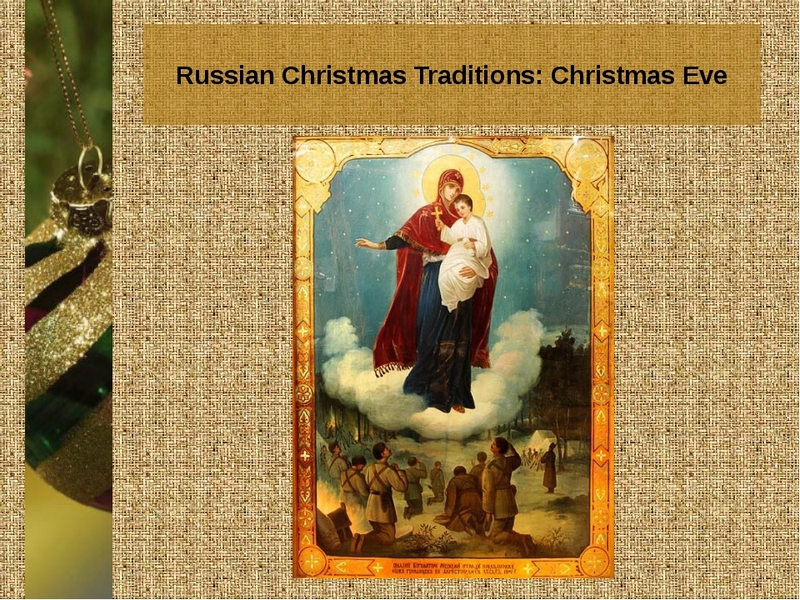 Christmas in Russia: Christmas post, Christmas Eve, Christmas time, Epiphany Christmas is a celebration of the birth of Jesus Christ, the savior of the world, with the advent of which people have hope in the mercy and goodness, truth, and eternal life. 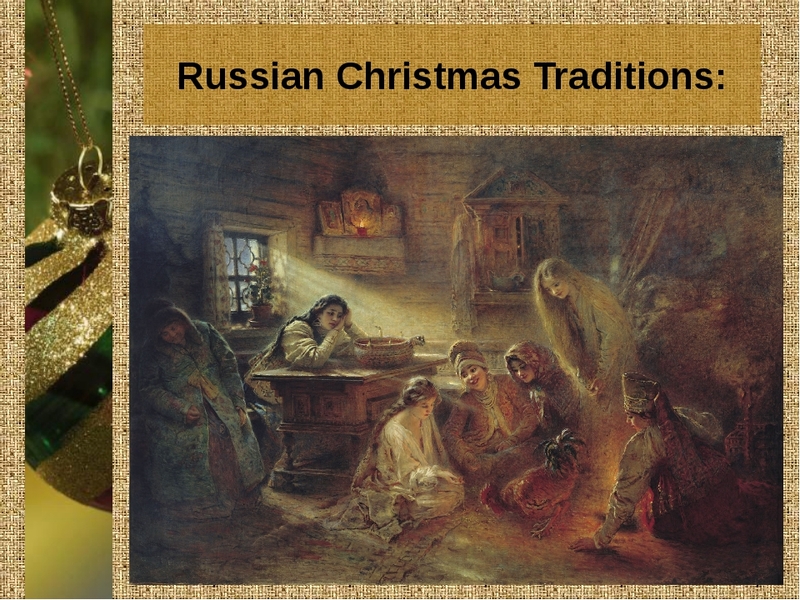 The Orthodox Church celebrates Christmas according to the Julian calendar on January 7, unlike the Western churches celebrating it on the 25-th of December according the Gregorian calendar. 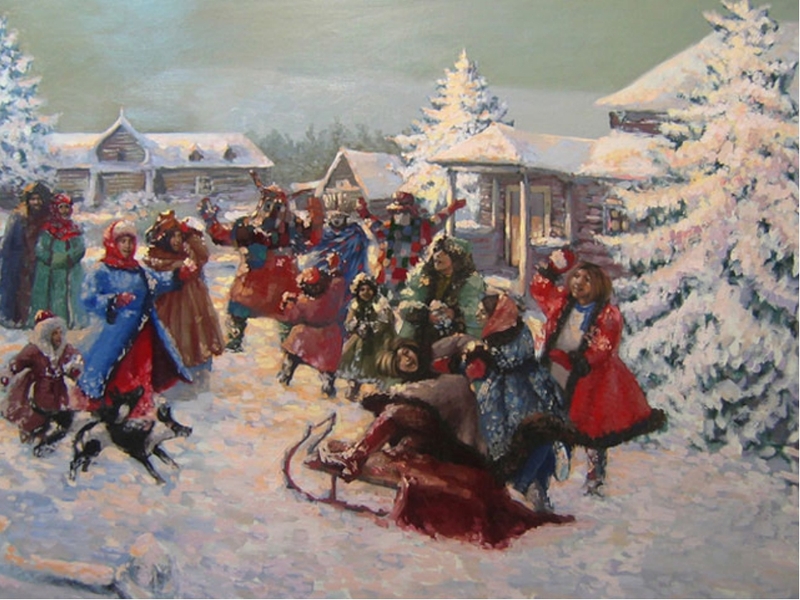 Russian Christmas Traditions: Christmas post Nativity Christmas is preceded by forty days fasting, which ends by Christmas Eve (January 6). 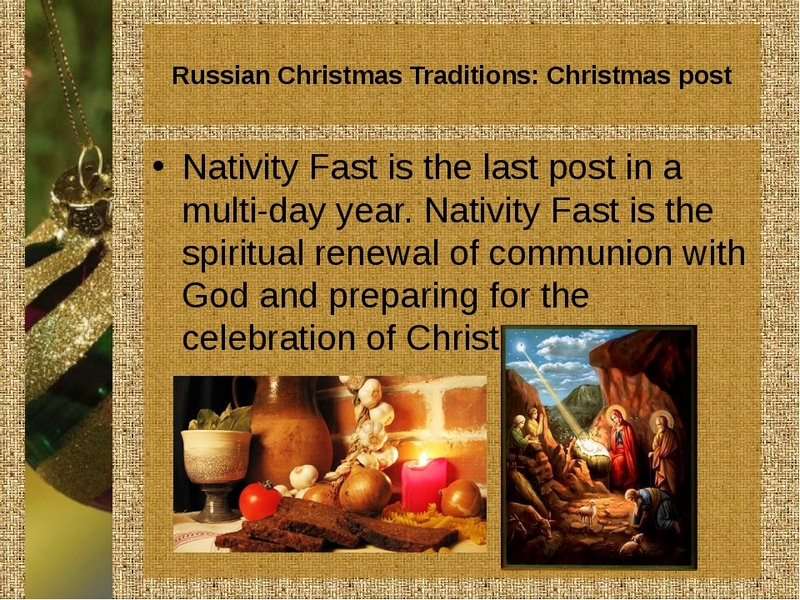 Russian Christmas Traditions: Christmas post Nativity Fast is the last post in a multi-day year. 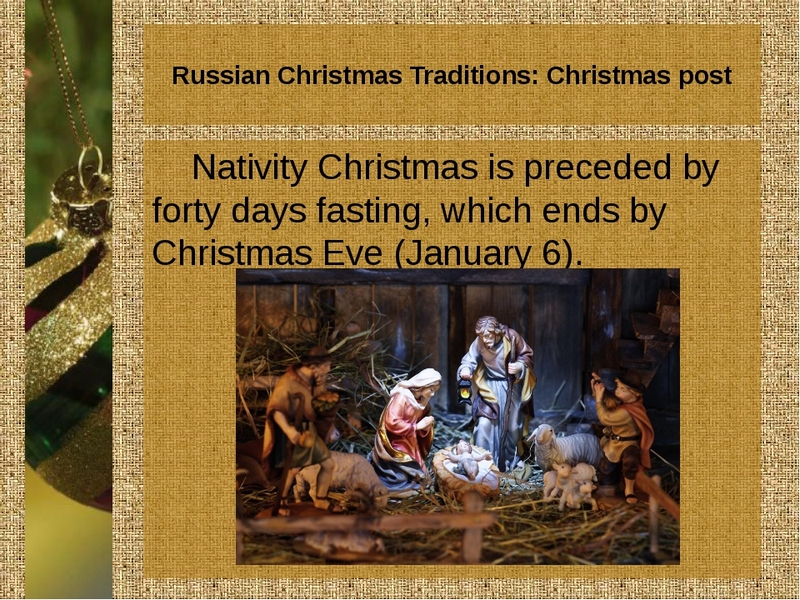 Nativity Fast is the spiritual renewal of communion with God and preparing for the celebration of Christmas. 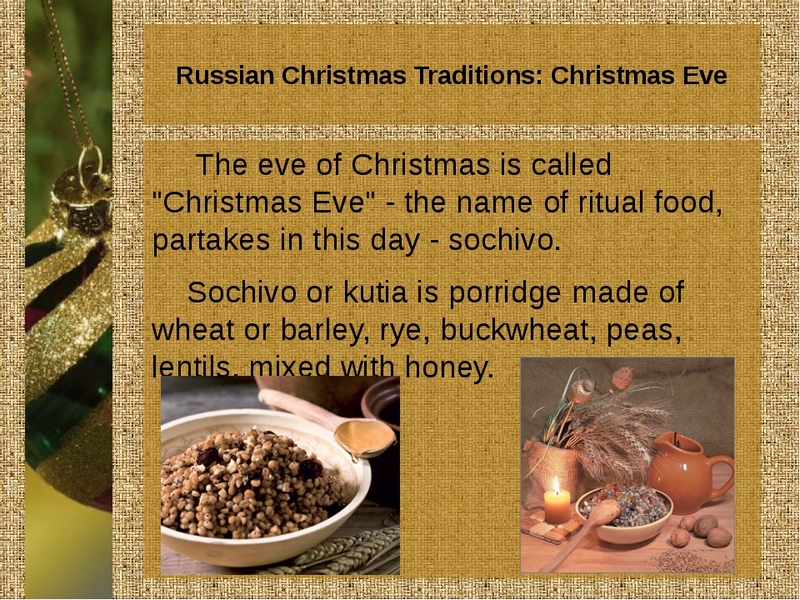 Russian Christmas Traditions: Christmas Eve The eve of Christmas is called "Christmas Eve" - the name of ritual food, partakes in this day - sochivo. Sochivo or kutia is porridge made of wheat or barley, rye, buckwheat, peas, lentils, mixed with honey. 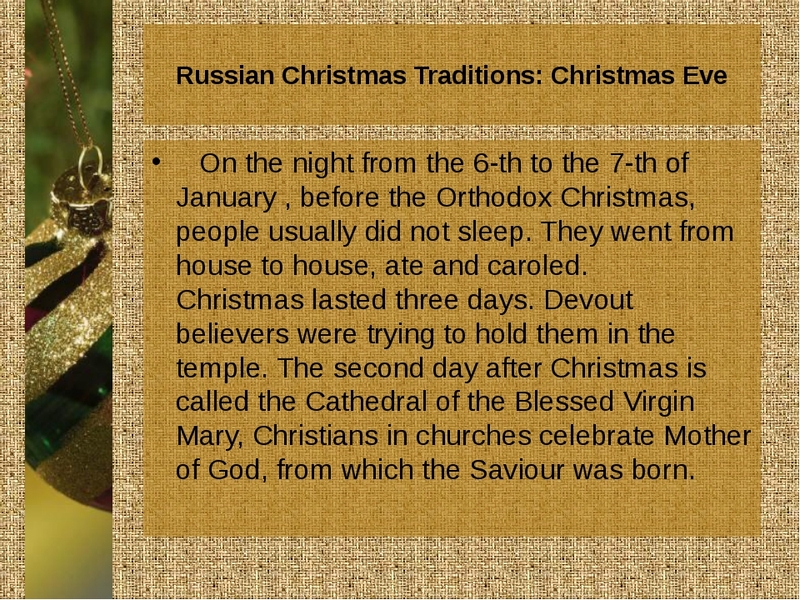 Russian Christmas Traditions: Christmas Eve On the night from the 6-th to the 7-th of January , before the Orthodox Christmas, people usually did not sleep. They went from house to house, ate and caroled. Christmas lasted three days. Devout believers were trying to hold them in the temple. The second day after Christmas is called the Cathedral of the Blessed Virgin Mary, Christians in churches celebrate Mother of God, from which the Saviour was born. 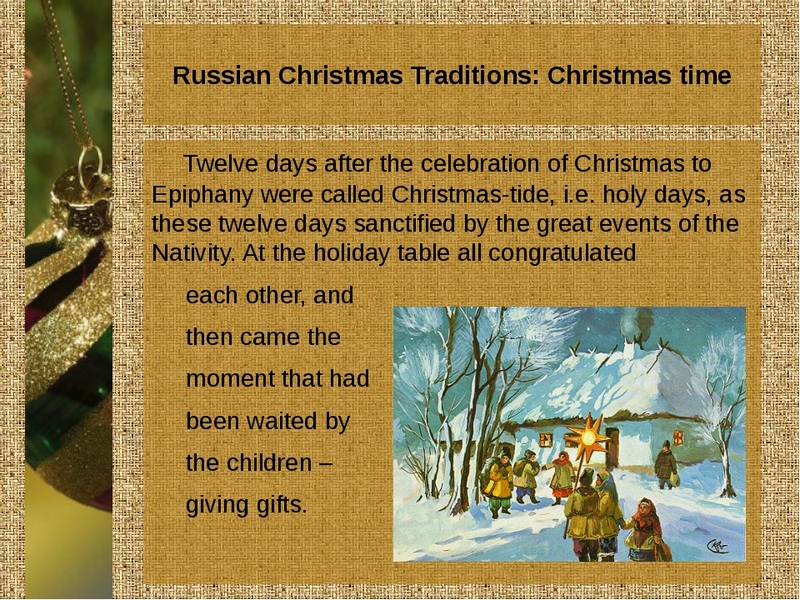 Russian Christmas Traditions: Christmas time Twelve days after the celebration of Christmas to Epiphany were called Christmas-tide, i.e. holy days, as these twelve days sanctified by the great events of the Nativity. At the holiday table all congratulated each other, and then came the moment that had been waited by the children – giving gifts. 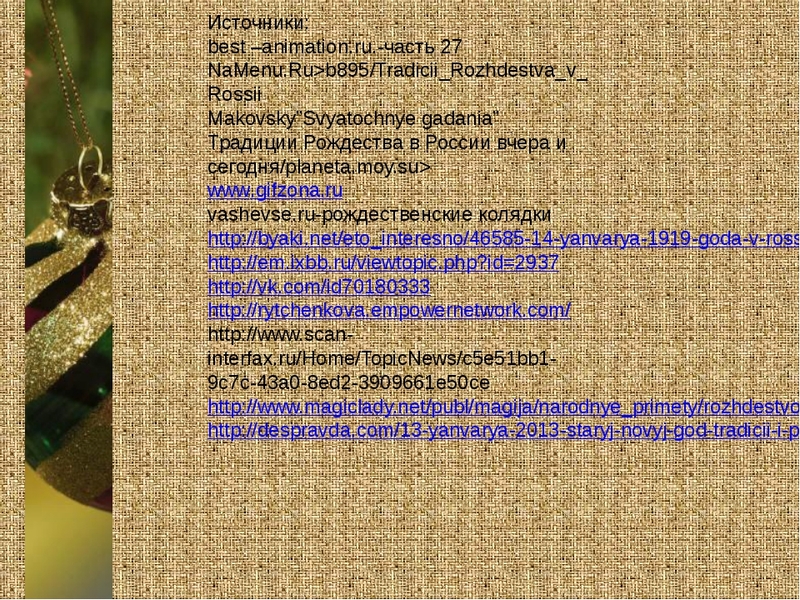 Shchedrivkas Sparrow flies Tail wagging, And people know! 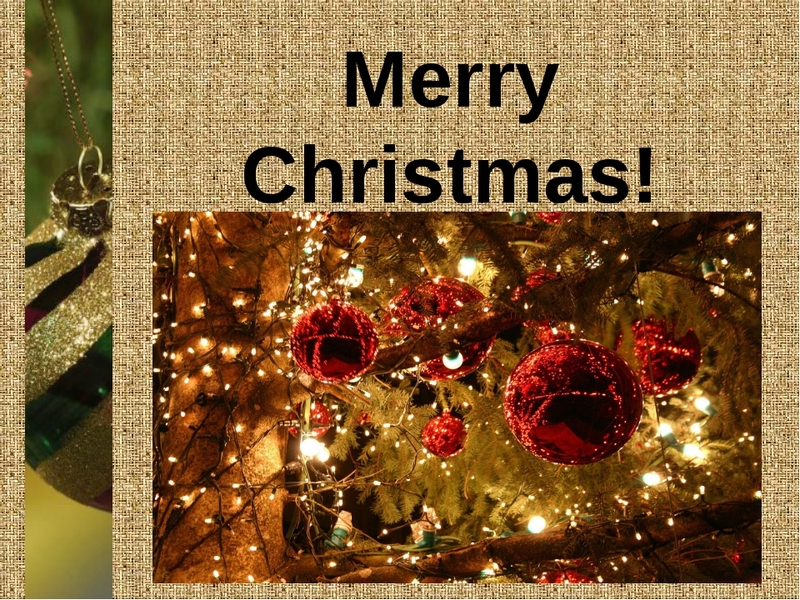 Tables blanketed, Guests take, Christmas Meet! Воробушек летит, Хвостиком вертит, А вы, люди, знайте, Столы застилайте, Гостей принимайте, Рождество встречайте! Winter holidays begin with caroling or shchedrivkas. 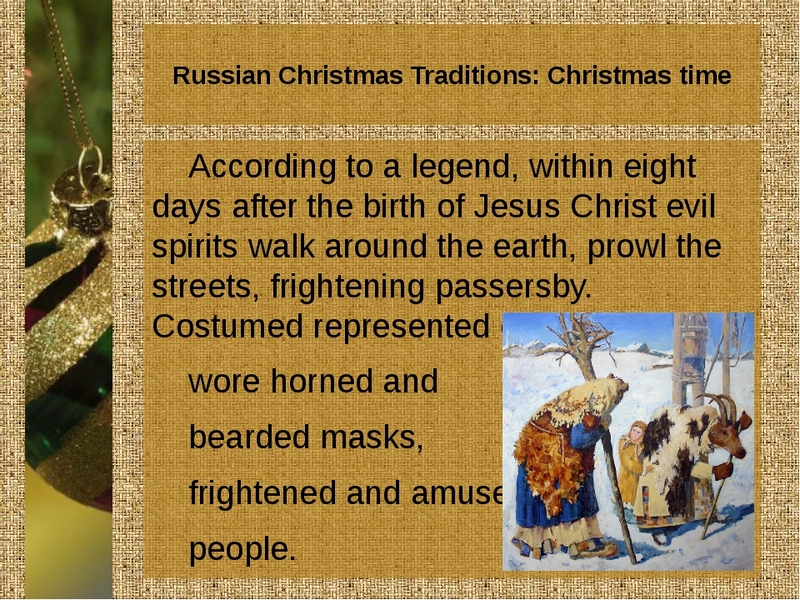 Russian Christmas Traditions: Christmas time According to a legend, within eight days after the birth of Jesus Christ evil spirits walk around the earth, prowl the streets, frightening passersby. Costumed represented evil spirits, wore horned and bearded masks, frightened and amused people. 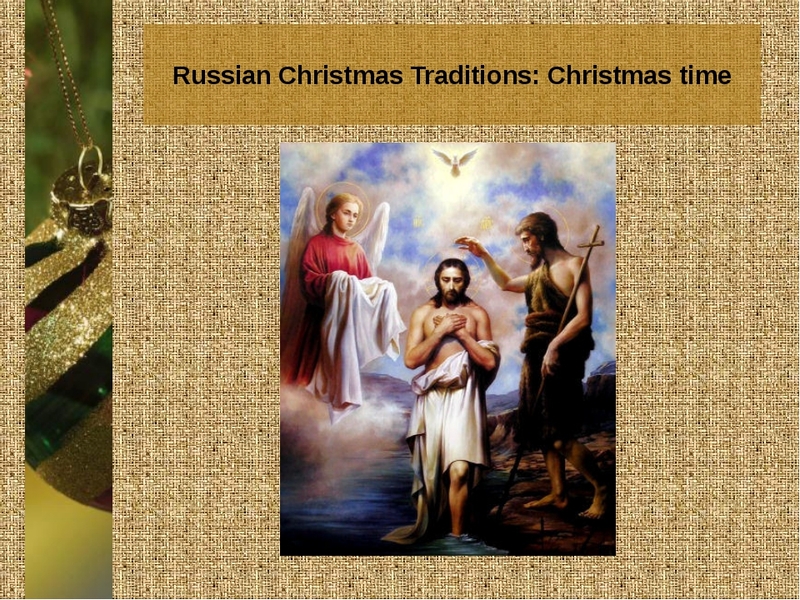 Russian Christmas Traditions: The Epiphany January, 18 comes Epiphany Eve. Traditionally it’s not without divination(гадание). 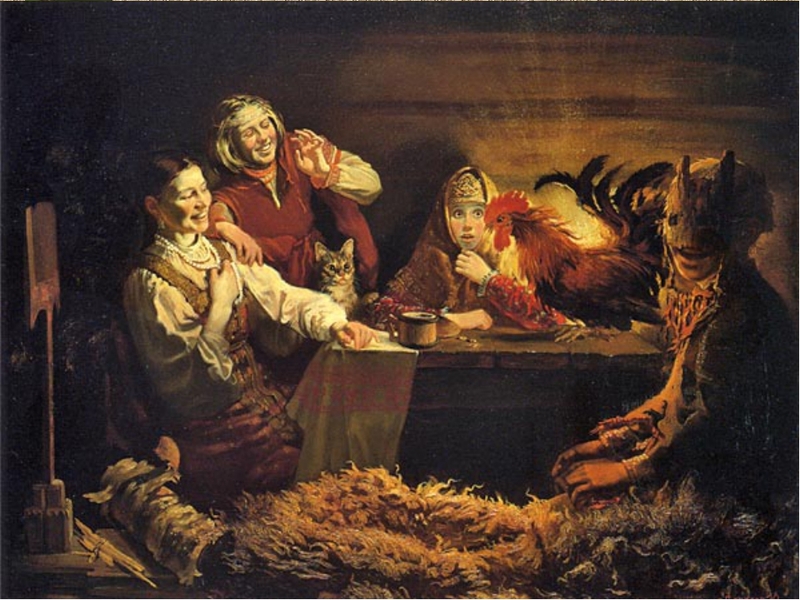 In older times the whole family, young and old, and sometimes even a few families participated in divination. This ritual had been preserved since pagan times. Christmas symbols Christmas star. 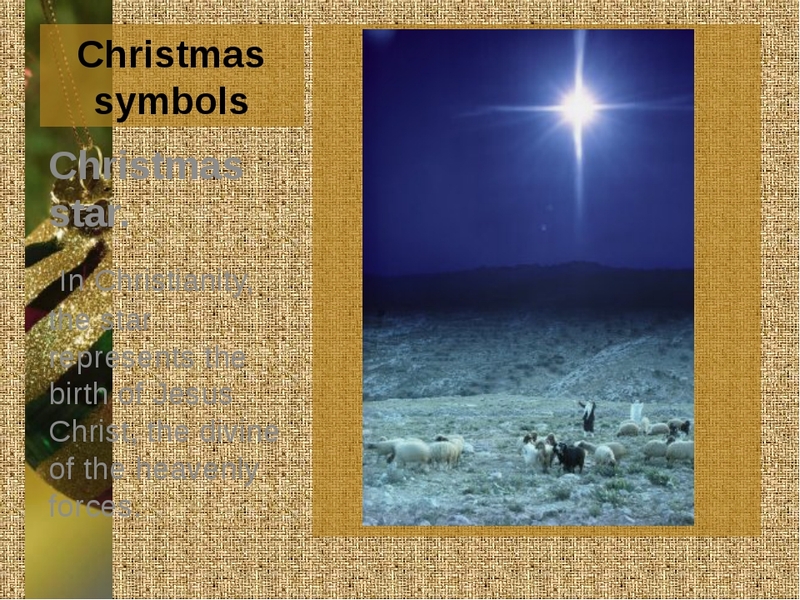 In Christianity, the star represents the birth of Jesus Christ, the divine of the heavenly forces. 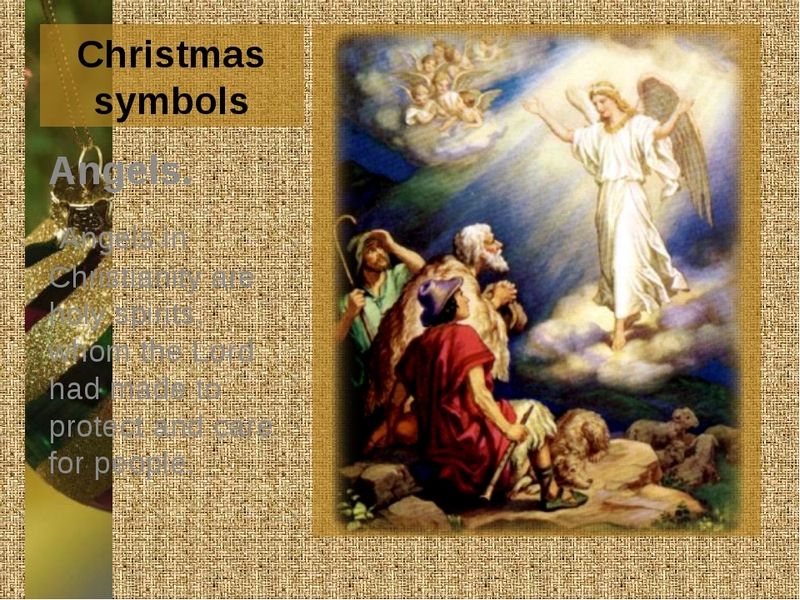 Christmas symbols Angels. Angels in Christianity are holy spirits, whom the Lord had made to protect and care for people. 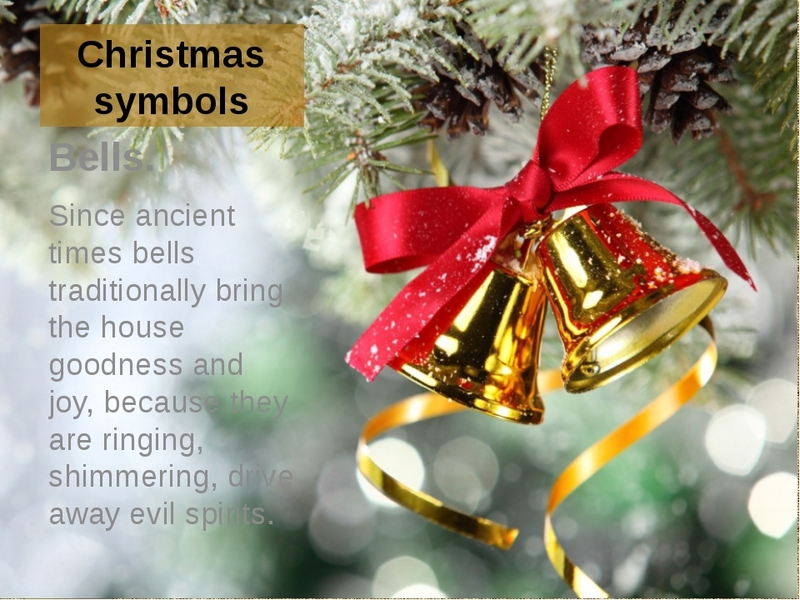 Christmas symbols Bells. Since ancient times bells traditionally bring the house goodness and joy, because they are ringing, shimmering, drive away evil spirits. Christmas symbols Snowflakes. 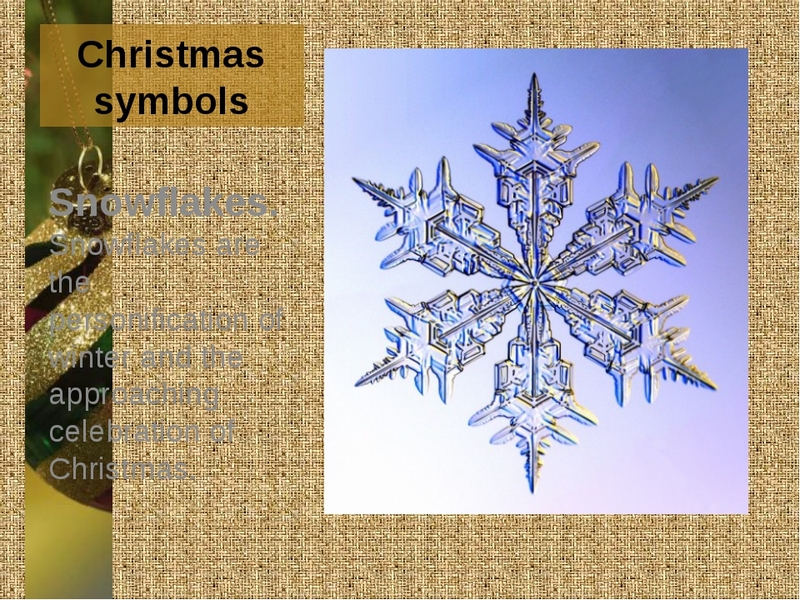 Snowflakes are the personification of winter and the approaching celebration of Christmas. Christmas festivities and games And of course, in the old days at Christmas and after it, everyone likes walking, playing and having fun. Most like to dress up and play the presentation. 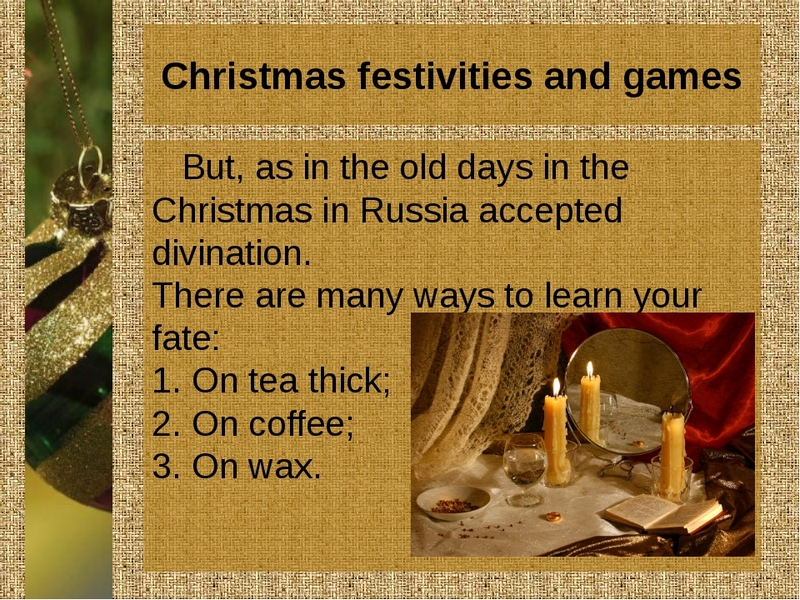 Christmas festivities and games But, as in the old days in the Christmas in Russia accepted divination. There are many ways to learn your fate: 1. On tea thick; 2. On coffee; 3. On wax. Christmas festivities and games A great number of wills are connected with Christmas. Thaw in the day means the yield of buckwheat. If the night sky is lit up by a lot of stars, this year will be a great harvest of berries and a considerable rise in the number of livestock. Also a good harvest will be, if the holiday heralds fall on Monday or Sunday. At Christmas it is strictly forbidden to be engaged in any chores around the house - knitting, washing, sewing, going hunting. Презентация создана совместно с учащимися 11 класса для использования на уроке,посвящённом Рождеству в России и англо-говорящих странах.Материал переводился с русского.Знакомит учащихся с традициями празднования Рождества в России,символами и обычаями,мотивируя обучающихся помнить русскую культуру,проводя параллель между двумя культурами и религиями.Может быть использована как в урочной деятельности,так и на факультативном занятии.Использовалась к учебнику "Spotlight-11'',но может быть использована к любому учебному комплексу при подготовке к Рождеству.